Since the 1970s, the term “information overload” has captured society’s anxiety about the growth in the production of information having potentially bad consequences for people as they struggle to cope with seemingly constant streams of messages and images. The advent of the internet, it was thought, would only exacerbate this, with the onset of ubiquitous connectivity turning information overload into something even more debilitating. 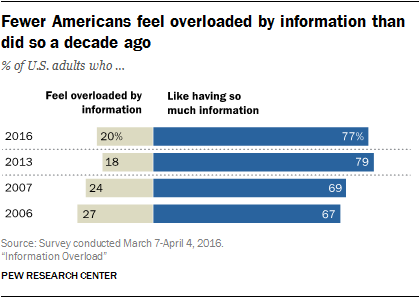 A new Pew Research Center survey finds that, for the most part, the large majority of Americans do not feel that information overload is a problem for them. Some 20% say they feel overloaded by information, a decline from the 27% figure from a decade ago, while 77% say they like having so much information at their fingertips. Two-thirds (67%) say that having more information at their disposals actually helps to simplify their lives. The survey shows that most Americans are comfortable with their abilities to cope with information flows in their day-to-day lives. Moreover, those who own more devices are also the ones who feel more on top of the data and media flows in their lives. Those who are more likely to feel information overload have less technology and are poorer, less well-educated and older. The Pew Research Center survey in April 2016 of 1,520 Americans age 18 and older measures how they cope with information demands in their lives and how they feel about the volume of information they encounter. Generally, Americans appreciate lots of information and access to it. Still, even as many feel they have a relatively easy time handling information flows, there are two tensions around information that emerge in the survey results. First, those with fewer pathways to the internet are more likely to express concerns about information overload and to report difficulty in finding information they need. We highlight three kinds of access pathways – home broadband, smartphone and tablet computer ownership – as a way to characterize people with “access abundance” (that is, they have all three) compared to those with relative “access scarcity” (that is, those with one or none of those access assets). Those with “access abundance” say they have easier times managing information than others. Just one quarter (24%) of these adults say they sometimes have difficulty finding information. By contrast, half (49%) of those with relative access scarcity say this. Second, when institutions expect people to bring a lot of information with them to carry out tasks, some Americans find it can be burdensome to keep track of the volume of information needed. Nearly half (46%) of Americans say this statement describes them “very well” or “somewhat well”: “A lot of institutions I deal with – schools, banks or government agencies – expect me to do too much information gathering in order to deal with them.” Those who feel this way are more likely than others also to say that keeping track of information is stressful for them (56% vs. 30%). These findings suggest that information overload may not be the right way to frame anxieties about the volume of information in people’s lives. Rather, information overload is more situational: Specific situations may arise, such as when institutions impose high information demands on people for transactions, which create a sense of information burden for some Americans.